The birthplace of the founder of the Maratha empire, Shivaji Maharaj, is this city located in the Pune district of Maharashtra known as Junnar. Don't road trips always have something exciting about them? You can plan one too! From Mumbai to Junnar shall be a pleasant trip of about 166 km. But why would one want to travel to Junnar? It shall fascinate you to know that it has been serving as a miracle place for curing breathing problems right from the British era by being called 'Sanitarium Of India" due to less pollution. It has a vibrant history of 3000 years beginning from the times of the very first King, Satvahan Raja. It also flaunts agritourism and lots of ancient cave temples. Junnar has all it requires: ranging from ancient ghats like Naneghat to the intricate forts and wonderful water reservoirs and a brilliant culture sprinkled on it. By road: You can always hire a taxi, drive a car along with your friends and family or hop on a bike to hit the road to Junnar from Mumbai. It takes around 4 hours. There are regular buses every hour from Pune, that traverse to and from Junnar. By rail: The Pune railway station is joined to important cities like Nagpur and Mumbai via regular trains and is in closest proximity to the city of Junnar. By air: At a distance of about 154 km, the Chhatrapati Shivaji International Airport is most readily accessible to commute to Junnar. It covers all the major towns and cities inside and outside the state of Maharashtra and taxi and cab service from the airport make the route to Junnar even simpler. Well, knowing about a few places of tourist attraction in Junnar in detail won't hurt right? The layout of the famous Shivneri fort is praiseworthy and is definitely worth visiting as the famous Maratha warrior had taken birth here in 1630. The main fort has a lot of barriers to it in the form of seven gates and the central area of the fort houses Badami Talavi, a small water pond. In close proximity of the pond, you can spot the idol of Shivaji along with that of his mother Jijabai. The memories of Shivaji's childhood are preserved in this fort and did you know that he polished his military skills in this very palace as well? You must be wondering what else lies within the fort which shall attract your attention? Well, you can explore Dongarmatha, Kadeloot Tok and Kaman Take on the inside as well as Ambarkhana, Kadelot Point, Ganga Jamuna and NaneGhat around the fort. A tribute is paid to Goddess Shivani in the form of a temple near the fort, which is also quite frequented by tourists. Enjoy a nice time at the fort admiring the greenery with your close ones as it is only 4 km away from Junnar. Imagine a mountain pass at an elevation of 2600 ft from the ground, blowing your mind away. It is located in the Western Ghats range near Junnar in the Thane district of Maharashtra. The pass very well served exclusively for trading purposes between Kalyan and Junnar. It was considered a crucial trade route as it joined the harbour of Sopara and Kalyan directly to Junnar and Paithan. Wondering why the name 'Naneghat?' Nane means "coin" and ghat means "pass". The trek also served as an excellent toll booth for the collection of toll tax from traders going across the hill. The most apparent spots of admirable beauty were the summit of Vandarlingi and the distinctly shaped thumb-like peak which was popularly known as 'Nancha Angtha'. A Ganesha Temple can be located on the other side of the pass. Located in the Aurangabad district of Maharashtra, Junnar Caves are at a distance of 177 km from Mumbai and 96 km from Pune. The Buddhist pilgrims do traverse this place a lot as it is a prime destination of pilgrimage for them. 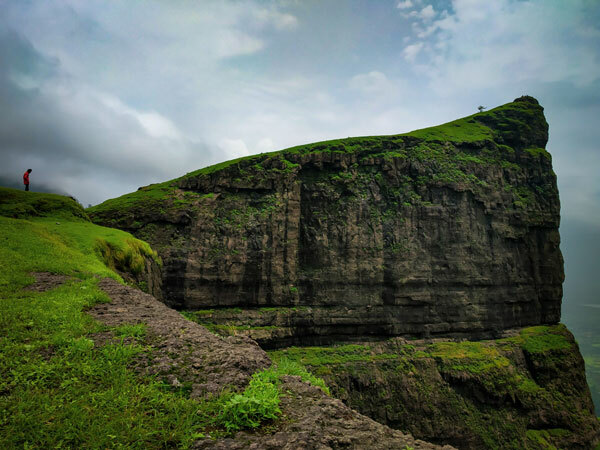 If seen from the archaeological point of view, the Junnar caves have been distinguished into various groups namely the Tulja Caves, Manmodi Group of Caves, Shivneri Group of Caves and Ganesh Lena Caves. If you ask which are the group of caves of prime importance, it shall be the Lenyadri or Ganesh Lena Caves which are about 6 km north of Junnar seen across the river Kukdi. You shall be astonished to know that it comprises some 30 caves expanding from east to west, facing the south direction and overlooking the Kukdi river valley. Did you know that cave number 7 shelters one of the Ashtavinayak shrines, a set of eight prominent Ganesh shrines in Maharashtra? Cave 6 and 14 are Chaityagrihas (prayer halls) whereas the rest are small in size and known as Viharas (rainwater reservoirs). They only have two to three cells and sometimes a front verandah. The visitors have to travel some 300 steep stairs to see the caves. Also, the Chaitya Hall is quite mesmerizing with its circular dome ceiling. It is located within the Tulija Lena Group Of Caves and is quite unique in nature as it is spacious and stands out from many other Chaityas found in caves of India. Archaeologists come to take a look and verify the sculptures and images in the caves. One cannot stop praising the Ganesh Lena caves as well because they are simply gorgeous. They comprise a Vihara, numerous small cells and Chaityas. Hence, the Junnar caves are quite spectacular. What would you call the 30 rock-cut Buddhist caves? Lenyadri it is. Our Hindu deity Ganesha has cave number 7 solely dedicated to him. The word 'Girija' means Parvati in our Hindi language and 'Atmaj' means 'son'. So, Lord Ganesha is referred to as 'Girjijatmaj' which stands for Parvati's son Ganesh. You will be astonished to know that it is the exclusive Ganesh temple built on a mountain and partly belongs to the Buddhist caves. People have included the tour to this temple as an addition to their Ashtavinayaka pilgrimage. The face of the idol is towards the north and its trunk is towards the left. Can you imagine that there is no electricity inside the temple? The temple shines golden by the bright rays of the sun itself and thus, visiting the temple before nightfall is mandatory. The hall of the temple is devoid of pillars and devotees have to cover around 283 steps to reach the door. It shall be a scenic sight for your eyes to soak in the stunning view of the temple as well as the charm of the Kukadi river. Food constitutes an important part of any travel itinerary. Misal is a must-try item in Swami Samarth Misal, near Junnar Market Yard. Misal Pav seems to be famous around Junnar. The vegetarian restaurants near Shivneri fort are well-recognized for serving food items which taste good and are not too oily or spicy.